The dairy industry has finally been given one big swift kick where they need it most, in the scientific credibility department where top officials have been falsely linking dairy and bone strength for decades. The study, published by the British Medical Journal, found that people don’t get stronger bones by eating dairy products or taking calcium supplements. Dairy products, specifically milk is one of the beverages still aggressively pushed on children as a health promoting food, especially relating to strong bones. What interesting about cow’s milk is that the more people drink, the more likely they are to die or experience a bone fracture and other diseases. The risks are especially pronounced for women. Taking into account studies from around the world, the systematic review and meta-analysis found that those who took calcium were just as likely to suffer from fractures as those who did not. Dr Ian Reid from the University of Auckland in New Zealand stated that the focus on treating bone diseases, such as osteoporosis, needs to be elsewhere. “I think we’ve actually misdirected a whole lot of effort into the use of calcium supplements, in particular in North America, where use has been higher for last 30 years,” he said. 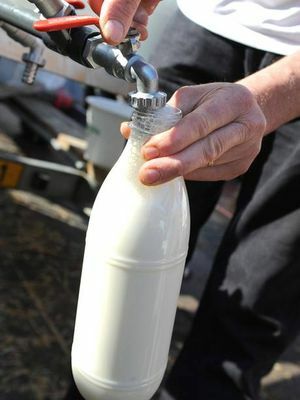 The dairy industy has been hard at work the last 50 years convincing people that pasteurized dairy products such as milk or cheese increases bioavailable calcium levels. This is totally false. The pasteurization process only creates calcium carbonate, which has absolutely no way of entering the cells without a chelating agent. So what the body does is pull the calcium from the bones and other tissues in order to buffer the calcium carbonate in the blood. This process actually causes osteoporosis. Pasteurized dairy contains too little magnesium needed at the proper ratio to absorb the calcium. Most would agree that a minimum amount of Cal. to Mag Ratio is 2 to 1 and preferably 1 to 1. So milk, at a Cal/Mag ratio of 10 to 1, has a problem. You may put 1200 mg of dairy calcium in your mouth, but you will be lucky to actually absorb a third of it into your system. Over 99% of the body’s calcium is in the skeleton, where it provides mechanical rigidity. Pasteurized dairy forces a calcium intake lower than normal and the skeleton is used as a reserve to meet needs. Long-term use of skeletal calcium to meet these needs leads to osteoporosis. Dairy is pushed on Americans from birth yet they have one of the highes risk of osteoporosis in the world. Actually, people from the USA, Canada, Norway, Sweden, Australia, and New Zealand have the highest rates of osteoporosis. The research investigated putative mechanism by which calcium intake affects bone health namely by increasing bone mineral density (BMD). BMD is a surrogate endpoint for fracture risk that allows biological effects to be explored in randomised controlled trials of modest size. The results from the new study flies in the face of long-held beliefs that calcium makes for stronger, better bones. For years, US guidelines have advised men and women to take anywhere from 1,000 to 1,200 mg of calcium per day to help prevent fractures and improve bone density. Reid said this likely lasted for so long due to an overreliance on studies from the 1970s and 1980s. Now, there are more sophisticated bone density studies, and none have shown the need for anything more than 500mg of calcium per day for bone density health. Going a step further, the study said too much calcium may cause build ups in the arteries or in the kidneys, which can cause ailments such as heart disease or kidney stones respectively. “Dietary calcium intake is not associated with risk of fracture, and there is no clinical trial evidence that increasing calcium intake from dietary sources prevents fractures,” the study said. The researchers looked at two studies, finding in one that increasing calcium intake from supplements increases bone density by 1% to 2%, something they said is unlikely to create a meaningful reduction in the risk of fracture. In another study, researchers found that dietary calcium is not associated with risk of fracture, with no clinical evidence finding that increase in consumption helps prevent fractures. Professor Karl Michaelsson from Uppsala University in Sweden wrote in an accompanying commentary with the study that the although recommendations point to those over 50 taking calcium, most will not benefit by increasing their intakes. “The weight of evidence against such mass medication of older people is now compelling, and it is surely time to reconsider these controversial recommendations,” he wrote. While some dairy may be useful to help the elderly keep weight on their body as they get older, many low-quality calcium supplements appear to be ineffective for bone health. Many of these supplements are increasing the risk of kidney stones and abdominal problems and whose risks are greater than the benefits. “They’ve been so entrenched and supported by industry for so long that it’s taking a while to turn around,” Reid said. If you want to supplement for calcium intake you must seek a reputable and balanced calcium/magnesium formula. Researchers examined 21 formulations of calcium carbonate (both natural [i.e., oyster shell] and refined). Four out of seven natural products and four out of 14 refined products, including brand products, had measurable lead content. A research team in California found essentially the same contamination in calcium supplements. Acid rebound. Calcium carbonate may cause acid rebound: the stomach overcompensates for the high dose of calcium carbonate, which is alkaline, by churning out more acid. For that reason, people with a history of stomach ulcers are advised that they may not tolerate it and may have to switch to calcium citrate. Constipation. Calcium supplements can have a mild binding effect but by themselves don’t usually cause serious constipation. But if you’re taking another supplement or medication that binds the stool, the addition of calcium supplements could cause a problem. Too much calcium. Although it doesn’t happen often, some people have taken so much calcium that it causes hypercalcemia, an above-normal level of calcium in the blood since most of the calcium carbonate is not absorbed. Hypercalcemia may cause nausea, vomiting, confusion, and other neurological symptoms. The type of minerals in the formula determines the absorption levels: Opti-Cal/Mag with Vitamin K2 is a co-enzyme complex, heat-stabled molecules that must be associated with another enzyme for them to perform their function in the body. It is necessary in the utilization of vitamins and minerals for proper delivery to the cell nucleus. One study found that Opti-Cal/Mag complex is 8.79 times more absorbed into the blood than calcium carbonate and 2.97 times more than calcium gluconate. Eat foods high in calcium. The best food sources are non-pasteurized raw dairy sources such as raw milk/yogurt, as well as bony fish, such as sardines. Leafy green veg such as kale, broccoli and spinach are also rich in calcium. Dried herbs and dried fruits such as figs and currants are also good choices. Seeds such as sesame, chia and flax are also rich sources of calcium. Also, enjoy foods that contain sulfur such as garlic and onions. Try not to eat whole grains and calcium-rich foods at the same time. Whole grains contain a substance that binds with calcium and prevents proper absorption. Some foods that contain compounds such as oxalic or phytic acids, such as sweet potatoes, beans, rhubarb, celery and beets, can also decrease the amount of calcium that’s absorbed when eaten at the same time as calcium-rich foods. Pass on phosphate-containing foods such as soft drinks. Phosphorus causes the body to excrete calcium. Limit or avoid high-protein animal foods. A diet high in protein causes calcium to be excreted from your body. Decrease caffeine consumption. People who smoke have significantly lower bone density, while drinking alcohol can also prevent your bones from absorbing the maximum nutrients from your food. Vitamin D helps the body absorb calcium. Although some is found in oily fish, our main source comes from the effect of sunlight on your skin. It’s estimated that half of us have a deficiency because we don’t get outside enough or because we always use sunblock. It is especially important to maximize sun exposure between May and September to keep vitamin D levels topped up. Just 10 minutes of sunlight a day on bare arms and your face can cut your risk of bone fractures by a third. A half hour exposing your torso is equivalent to roughly 10,000 units of Vitamin D.
Acid-blocking medications used for heartburn and other gastrointestinal conditions can block the absorption of calcium through the stomach walls. Stomach acids break down food during the digestive process, allowing the nutrients to become absorbed into your body. Medications designed to stop acid production or decrease the amount of acids present in your stomach can have a negative effect on calcium.